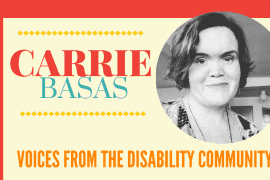 Welcome to “Voices from the Disability Community: – the series that introduces interesting people with various disabilities by asking the same set of questions to everyone. The point of doing that is share the diversity within the disability spectrum and experience, and get to know some cool people. 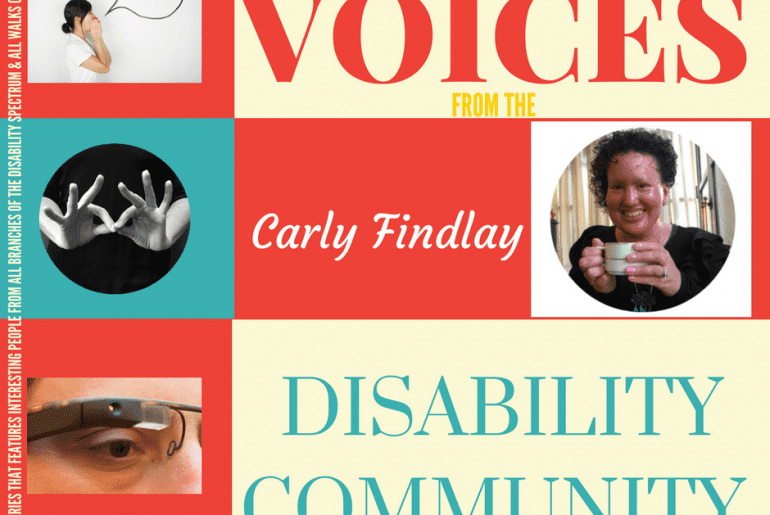 This week I’m delighted to feature my buddy, Carly! Carly and I have been friends (who haven’t met in real life yet) since..when? I think that whole blowout with The Mighty? I distinctly remember messaging her while I was in Cambodia and being really grateful for her voice. So now you get to meet her, too! What’s your connection with disability? I live with a disability, though I didn’t identify with having one until my late 20s. My disability niche, if you like, is appearance diversity – living with a facial difference. I have a rare, severe, painful genetic skin condition called Ichthyosis. Star Trek or Star Wars? Ha! I have never watched either. My husband is a big Star Wars fan. He wanted a Star Wars themed wedding. I said no. He wore a Star Wars Disney pin on his lapel and Yoda socks with ears. He encourages me to watch Star Wars but so far I’ve avoided this. If you could live in any other country for 2 years, where would you go? I love the UK. I love London – the cool weather, culture, food and shopping is my thing! I’ve got a British passport so I could actually do it. What dish would your bring to our community picnic potluck? I made a fantastic chicken dish from Yottam Ottolenghi last year – it had rice, cardamom and berries in it and it was delicious. I’d bring that. I love to cook. 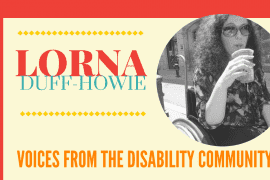 What do you do: I write and speak about disability, chronic illness and appearance diversity. I run Facebook groups for bloggers with disability and chronic illness, and also people living with Ichthyosis. I also connect people with Ichthyosis, give advice to new parents and adults living with the condition. In 2015 I organised Australia’s first Ichthyosis meet. I am also a wife, a bad housekeeper but great cook, host a podcast, love to travel, love live music, enjoy reading and devote my life to fashion. I’ve enjoyed writing from an early age, writing stories and reading a lot at school. I always wanted to be a journalist but I grew up in a small rural Australian town which didn’t have any universities with media courses nearby, and my parents hesitated to send me away to a city university because of the expense and my health. I studied a Bachelor of eCommerce at a local university, and then moved to Melbourne for work when I was 21. Two years after that, I commenced a Master of Communication (and took seven years to complete it because of full time work and my health). While I had been blogging on and off since 2001, it was never for professional reasons. Midway through my Masters, I started my current blog, then called Tune Into Radio Carly, so I could implement some of the things I’d learnt in my studies and create a portfolio. Initially I didn’t write about living with Ichthyosis but once I did, it received such a great response from readers that I decided to write more. I pitched myself to a disability focused government website and wrote for them for a few years. One of the pieces I wrote for the government was republished on a large Australian women’s website, and that was the start of writing for mainstream media. I have won a few media awards, one of which allowed me to do a course about writing and pitching for magazines. And that gave me the confidence to pitch to online publications. Many articles have been picked up because an editor read my blog. And I dabbled in speaking at my day job, which I let people know about, and now I receive requests to speak at a range of events. Because of my blog I spoke at a university overseas, and was the speaker before Australia’s first female Prime Minister, Julia Gillard, at an event in Melbourne last year. I have recently dropped my day job hours to part time so I can write and speak more, and this has been quite successful so far! I’ll still be writing, hopefully for international media. I want to be doing regular TV and radio, be on my way to completing my doctorate, have written a memoir and a children’s book (hopefully best sellers! ), living in our own home – no longer renting – and planning another overseas trip. I hope I can still empower people through my words – giving them permission to love and have confidence in themselves while living with Ichthyosis, a facial difference or a disability. I admire people who keep on with their disability activism despite all of the challenges: those who shoosh them, people who don’t understand it, harassers, a crowded mediascape and the daily challenges of living with disability. People like you, Alice Wong, Dominick Evans, Vilissa Thompson, Jax Jacki Brown, Michelle Roger and Elisha Wright (and countless others), and of course, the late Stella Young. I also admire resilient feminists like Clementine Ford, Celeste Liddle, Lindy West and Tara Moss, and online creatives like Pip Lincolne, Emma Gannon, Liv Purvis and Dawn O’Porter. the you that was really struggling with something related to disability – what would you say? “It gets better. You will find your tribe. 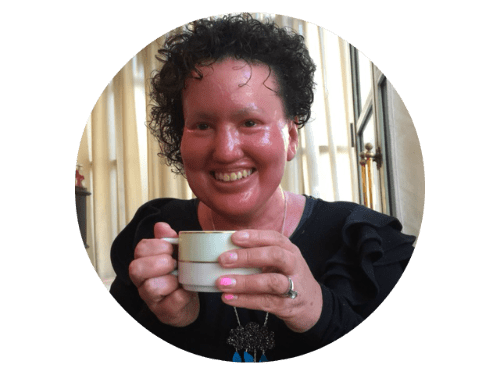 The thing that sets you apart (your appearance) will be the thing that brings you success.” I have written messages to my younger self here http://carlyfindlay.blogspot.com.au/2013/10/a-letter-to-little-ones-born-with.html. 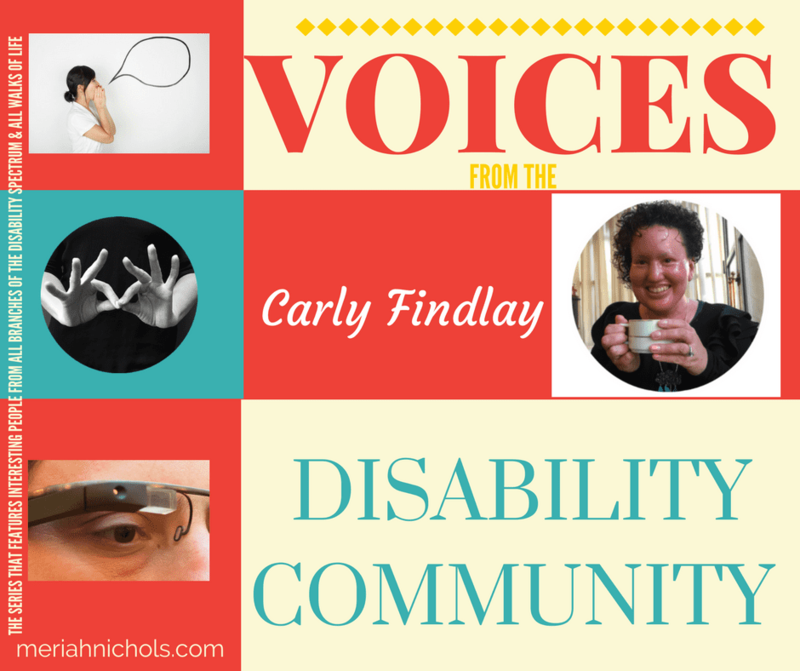 and here http://carlyfindlay.blogspot.com.au/2016/12/if-10-year-old-me-could-see-my-life-in.html. What do you like about your particular disability? My skin heals very quickly when I fall over or cut myself. It renews very quickly – 28 days worth of skin in one day! Today I fell down the stairs and it throbs and I’m miserable, but I know I’m a couple of days, the cuts will be healed. Also, this means I look really young. I’m 35 but could pass for 25. Adam says when I’m 100, it will look like he’s married to a 50 year old. That it’s nothing be ashamed about, or to be hidden. Disability is a part of our identity and culture. Being involved in the disability community feels like home. Also – I’d love it if parents would listen to the experiences of actually disabled people. I’m always so thankful when a parent writes to me to thank me for my work. What single piece of technology makes your life easier? My iPad. I do everything on it. Write, listen to podcasts, reply to emails, read books, watch TV. I love that what I write on my iPad is synced with my iPhone – I always have my writing with me. What the Hell do We Do About the ACA (“Obamacare”) Repeal?